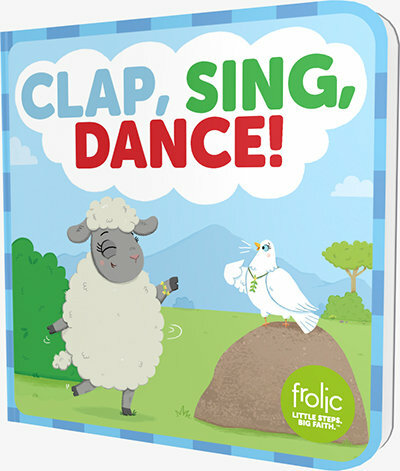 Book Birthday: Clap, Sing, Dance! Clap, Sing, Dance! (available today!) is a toddler action book that helps kids learn ways to show joy and praise with their bodies and encourages them to move. There’s an old saying: “When we sing, we pray twice.” Even if you can’t carry a tune, listening to music with your child, clapping or dancing together to a favorite song, or playing simple instruments can be opportunities to help toddlers pray and praise God. Music and prayer have a long history together. The psalms we find in the Bible were sung prayers used by the Hebrew people to praise God. For centuries, churches have used music to enhance worship and help people connect with God. And music has long been one of the ways we teach young children about Jesus. Singing songs about God’s love, the wonderful world, or the love we have for one another can all serve as prayers for little ones who aren’t interested in quiet, spoken prayers. We all know how easy it is to get a song stuck in our heads. That’s because music, with its combination of words, rhythm, and pitch, activates the brain in a way spoken words alone can’t. So not only are songs a handy way to pray with little ones; they can also help the words and ideas of the prayer sink in and take hold in your child’s memory. So sing, dance, clap, play, listen, create, and praise God together with music! You’ll be helping your child build a lasting practice of prayer and praise.